Burrito Blog: Deceptive Photography? No. This is the torta from TaQueria La Mexicana. It spills off the plate. 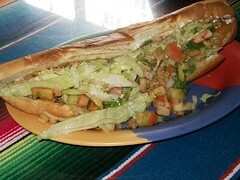 In their official photo, the torta appears much smaller. I promise you, it is not small. Zach was craving a nap after downing this thing. A $4.75 sedative - what a deal. This TaQueria La Mexicana meal was rated: 6.4. Tuesday, May 03, 2005 by Jonah.